Can you put a VPN on a Sky or Virgin Media Router is an age-old question that we’re going to answer in this guide. Unfortunately, the simple answer is no. It is not possible to put or set-up a VPN on a Sky or Virgin router directly. 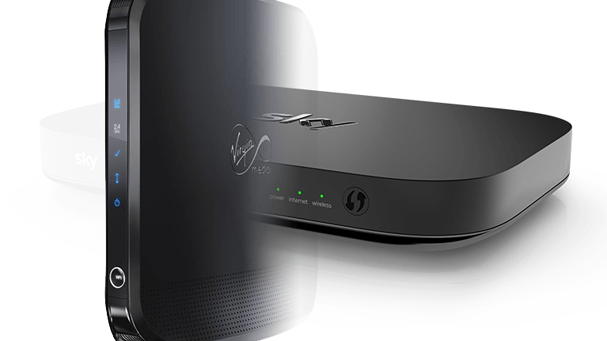 As routers for both services are basically supplied by Sky or Virgin themselves they don’t allow for a lot of customisation and apart from getting you connected to the internet and a bit of adult or time filtering there is very little you can do in the way of additional features. There are however solutions that will allow you to use a VPN on either a Sky or Virgin Media internet service. Below we explore the best. But won’t individual solutions limit me? One of the benefits of using a VPN on a router is the fact you can essentially connect an unlimited number of devices. While it’s true that using individual VPN solutions on devices can limit you, with providers such as NordVPN and VPN.ac offering connections on up to 6 devices concurrently, they really can cover all your needs with just one account. What about a VPN for my Kodi box? By far the biggest reason most users want a VPN on their Sky or Virgin router these days is because they have a Kodi box and want to protect their privacy or access blocked add-ons. If you’re one of them and you have either some kind of Fire TV device from Amazon or an Android Box of some sort running Kodi then there is an incredibly easy way to get a VPN on your Kodi box directly. This means you don’t have to worry about getting a VPN on your router. For Amazon Fire TV and Fire TV Stick devices you can sign-up and download a VPN app from IPVanish directly for the Fire TV and Fire Stick from the Amazon store. If you’ve got an Android Kodi box then there are even more choices, again IPVanish has an Android app but providers like ExpressVPN, NordVPN and CyberGhost VPN will also be suitable as a VPN solution for your Android box. What about a VPN for my mobile or tablet? If you’re after a VPN for your mobile or tablet device then there is plenty of choices as long as you have a device running either Android or iOS from Apple. With an estimated 99.6% of mobile devices running one or the other then there’s a pretty good chance you’ve got one too. Nearly every VPN provider has apps for Android and iOS devices so you really don’t have to try hard. Take a look at our VPN Comparison Guide and choose a provider that you like the sounds of. What about a VPN for my laptop or desktop? Like mobile devices, finding a VPN for your laptop or desktop is really easy. Any good VPN provider worth their salt will offer software for all types of laptops and desktops. It’s likely you’re using either a Windows or Mac computer and all the leading VPN services offer software for those operating systems. We especially like VyprVPN for its ease of use and VPN.ac has recently launched a completely redesigned desktop software which mirrors their mobile apps and makes using the service over multiple devices seamless. It’s worth checking both our Best VPN for Windows and Best VPN for Mac guides if you want to find the best VPN service to use with either your laptop or desktop computer on a Sky or Virgin Media internet connection. How about a Router solution for Sky or Virgin? Unfortunately, as we’ve already clarified, it’s impossible to configure either a Sky or Virgin Media Router to offer VPN access. The next best solution is to buy a VPN enabled router. The first and probably cheapest is to buy a device called an InvizBox Go. It’s not technically a fully sized router but essentially it provides the same service. The InvizBox Go is a portable VPN router which connects to your current Sky or Virgin router and creates a new hotspot with VPN functionality. Even though the size is small and portable we found the VPN speeds to be comparable to a full sized router. The only drawback is you’re locked into using the VPN service that comes with the device and although powered by top-rated VPN service IPVanish, if you have existing time left with another provider you can’t easily use it with the InvizBox Go, if at all. You can get the InvizBox Go directly from the manufacturer by visiting their website. If you’re after buying a full-sized router then there are a few options out there, but they’re not exactly cheap. We tested the Asus RT-N66U back in 2015 from Sabai Technology and while the interface is easy to use, the speeds are relatively slow and comparable with the cheaper InvizBox Go above. That said, Sabai Technology has released improved models in the interim years so speeds may well be a lot better these days. One thing we did love was the fact you can pretty much use the Sabai routers with any VPN provider. You can check out Sabai Technology by clicking here. Alternatively you can get a router configured directly for certain VPN providers. We tested the LINKSYS WRT1200AC for ExpressVPN and you can read our review here. What is the Best VPN for Sky and Virgin? Singling out one VPN provider as the best is almost impossible. What there is though is a range of providers who work best with both ISPs. We took a look at a range of providers and put together our Best VPN for Sky Internet and Best VPN for Virgin Media guides which both round up the Top 5 choices for both ISPs. If you’re interested to find out who worked best and more importantly, why they were suitable for use with Sky or Virgin then take a look at our dedicated guides. Sadly, neither the supplied Sky or Virgin Media routers can be configured to use a VPN service directly. We recommend opting for an app or software solution because they’re not only the cheapest solution but they also offer the best speeds too and with no complicated set-up you really can’t go wrong. If you really do want to opt for a router solution you’ll need to purchase either the InvizBox Go or one of the standalone routers mentioned earlier in this guide.